Our space is open to women and non-binary people and their children. We reclaimed our space on July 9th and will continue to be here until Hackney Council meet our demands. This means we'll be holding workshops for everyone to get involved in across the summer. While we have a variety of workshops and activities planned, you are welcome to visit us even if we have nothing scheduled, from 9am - 9pm. We'll be giving all local children free lunches during the school holiday. We have healthy (and not so healthy!) options. Drop by to help us feed, get fed, or to drop off food donations. This is an opportunity to get to know sisters informally over a meal. Come down and say hello! East End Sisters Uncut meets weekly, alternating between Thursdays and Saturdays. Come along to find out what we're up to and get involved in decision-making. Meeting starts at 7pm, but new sisters are welcome from 6:45pm. Our occupation is powered entirely by volunteers. Everyone is welcome to come by and get involved in the occupation. This could be coming to a workshop, meeting Sisters in the space and offering your help, retweeting our social media posts, or simply offering us a few pounds as a donation. We understand that there are so many ways to make a difference and appreciate all of them. Sisters Uncut's space relies on donations from allies and supporters. What we need can change from day to day, based on what classes and workshops we are running, and the needs of everyone who uses the space. Don't worry if you can't donate, what we need most of all is your love, solidarity, and support. These could be secure homes for some of the 14,000 households on your waiting lists, or they could be self-contained temporary accomodation for those fleeing domestic violence. Generic hostels are not appropriate or safe places for survivors to begin their recovery and rebuild their lives. Use only self-contained properties or appropriate supported housing as temporary accommodation options for those fleeing domestic violence. The governments' estate regeneration plan means 915 council homes are set to be lost. Hackney Council's own regeneration schemes are losing council homes. There is a proud history of Labour councils refusing to do the Conservative government's bidding. From Leeds reclassifying its own homes to ensure tenants weren't hit by bedroom tax, to Poplar's councillors refusing to collect unjust rates and going to prison for it. The Housing Act will force Labour councils to take sides: either with the elite Conservative government or with their own working class tenants. The space is partially accessible with support. We have the use of a wheelchair ramp to the landing of the flat and then into the flat itself. The main door frame is 30" wide and the inside door to the living room is 31" wide. Most wheelchairs are up to 27" wide. We are very sorry that the toilets in the occupation are upstairs and not accessible. The nearest wheelchair accessible toilets are at Homerton Library and Tesco Morning Lane, which is open 24 hours from Monday to Saturday night. Everybody in this space is equally responsible for creating a safe and welcoming environment. When we come together to organise in a respectful and considerate way, we are creating the change we want to see in the world. 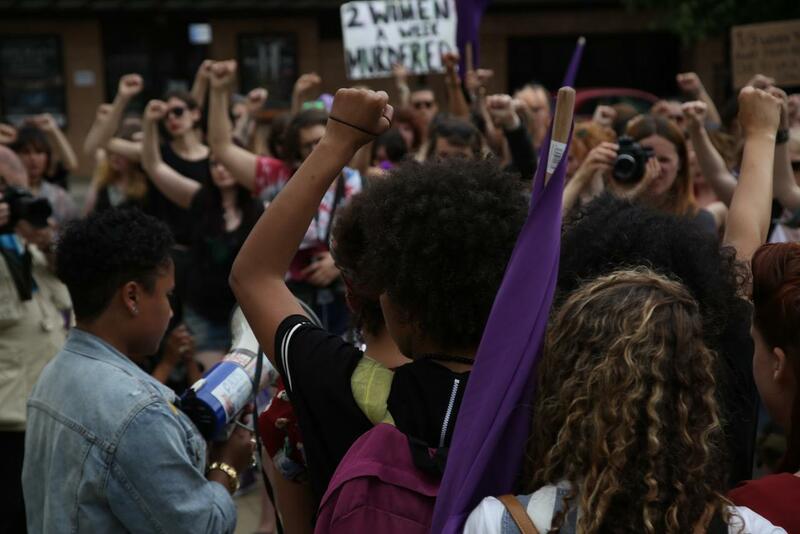 We welcome all women (trans, intersex and cis), all those who experience oppression as women (including non-binary and gender non-conforming people) and all those who identify as women for the purpose of political organising. Self-definition is at the sole-discretion of that person. Younger children of any gender should be accompanied by an adult. We recognise that people experience different kinds of oppression, often at the same time. We will not tolerate sexism, racism, transphobia, ableism, classism and homophobia or other forms of oppression. If you have behaved oppressively towards another person please listen carefully to what they are saying. Your reaction can be a huge step towards healing and remedying what you have done to hurt someone. There is a longer, and more detailed, Safer Spaces Policy posted inside the space. Any Sister will be able to show you it, and answer questions you might have. Our Safer Spaces policies are always works in progress, and if you have any comments or suggestions we would love to hear them. In the context of austerity measures, the brutal Housing Act, and Hackney's estate regeneration programmes we have taken back a council home set for demolition. We're turning into a community space with workshops, breakfast clubs, and activities. The link between provision of secure housing and leaving a domestically violent situation: how can they leave if they have nowhere to go? In a situation where 2/3 of women are turned away from refuges in Hackney or placed in shared mixed hostels for years on end, before being palmed off into unaffordale and insecure private rented homes, its clear that the options presented to those fleeing domestic violence are insecure, disruptive, and frightening. These could be secure homes for some of the 14,000 people on your waiting lists, or they could become self-contained temporary accomodation for those fleeing domestic violence. There is a proud history of Labour Councils refusing to do the Conservative Government's bidding. From Leeds reclassifying its own homes to ensure tenants weren't hit by the bedroom tax, to Poplar's councillors refusing to collect unjust rates and going to prison for it. The Housing Act will force Labour Councils to take sides: either with the elite Conservative government or with their own working class tenants. Generic hostels are not appropriate or safe places for survivors to begin their recovery and rebuild their lives. Use only self-containe properties or supported housing as temporary accomodation options for those fleeing domestic violence. The government's estate 'regeneration' plan means 915 council homes are set to be lost. Hackney Council's own regeneration schemes are losing council homes.